I’ve been working a lot lately on the technical side of things, all in preparation for the short. I’ll post some more tools when I get them ironed out, but for now here’s an update of my weight saving and loading tool called seithWeighTools. It’s made specifically for Maya 2011 (and up) and uses both MEL and Python code. And hopefully, it’s still very easy to use! Update: It also works with Maya 2012! did you work with the comet cartoon tools before? 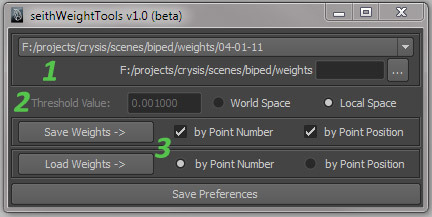 Do your weightTools work in Maya 2012?